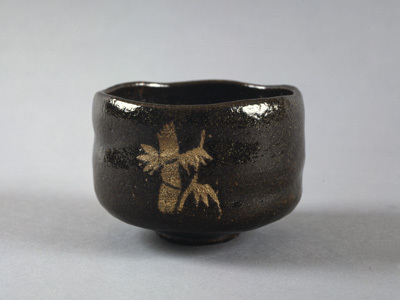 A lustrous pitch-black glaze is characteristic of Chônyû's glazing. On the front of the bowl a design of bamboo is achieved by leaving a part of the body unglazed. 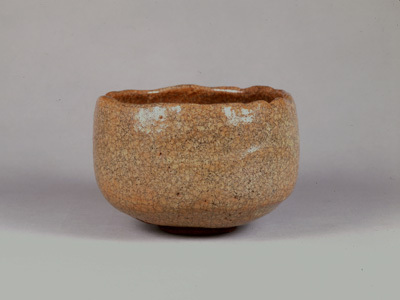 This effect is made possible as the application of glaze in Raku ware is done by brush. Large and generous with its gently undulating lip, this bowl is endowed with a sense of composure. The large area around the foot is left unglazed to show the juraku clay, while the rest of the body is coated with a milky glaze with a fine crackling. In 1729 an elephant was sent from Nagasaki via Kyoto to Edo. 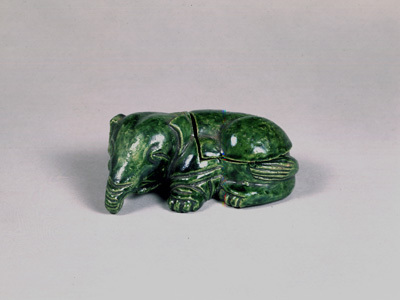 Did Chônyû possibly see this elephant? Chônyû is particularly capable in sculptural modeling and produced well accomplished examples of incense container and decorative object.